As part of his annual crop rotation scheme, Leigh Hauter over the years had planted garlic just about everywhere he could on his farm except for this strip of land on the slope just below his greenhouse. 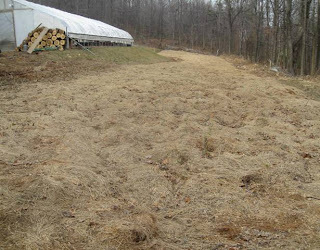 The previous owners of Bull Run Farm had not done much in the way of erosion control. "There was very little topsoil left on that slope," he said. 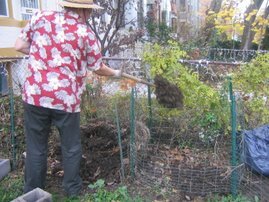 So he spent at least five years building the soil again with applications of compost made from horse manure and straw and the droppings from his chickens. This year, Leigh and his farmhand disagreed over whether the soil was ready for garlic. Leigh said no, the farmhand said yes. "I was never really happy with what had been growing up there," Leigh said. "I didn't want to risk putting my garlic all in one place where it wouldn't do well." Eventually, though, the farmhand prevailed. Garlic it would be. Leigh prefers a German porcelain variety of hardneck garlic. "It's done better for me, and it makes a larger bulb," he says. Garlic is divided into two types: hardneck and softneck. They are both grown exactly the same. But the hardneck has a determinate number of cloves (sometimes as few as four, but large) and produces a "scape," a stalk from which a seed head grows. The scapes--tasting of garlic and delicious as food--are harvested before the seed head forms. Softneck garlic, meanwhile, is the kind most often found in stores with an indeterminate number of cloves--often layers of them--as well as a thicker skin. Because of its thicker skin, softneck garlic stores longer. Garlic typically is planted in fall, then overwinters in the ground. Around August, Leigh orders 400 pounds of bulbs from a commercial grower in New York State. These will produce about 12,000 plants, resulting in 12,000 bulbs to be distributed to Leigh's 500 CSA subscribers. First Leigh tilled the soil on the slope, adding some more compost. Then they planted the cloves--pointy end up--using a mechanical device pulled along behind his tractor. 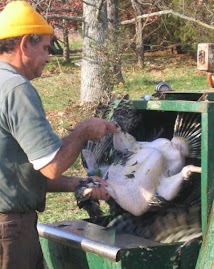 Two people ride on the device feeding cloves of garlic into a wheel that inserts the garlic about three inches below the soil surface, several inches apart, then covers them over. As long as you're driving the tractor straight, the method will create neat rows of garlic. The final step is to cover the garlic with a thick mulch. Garlic doesn't like competition from weeds. The mulch keeps weeds down as well as retaining moisture in the soil. Leigh uses hay from one of his neighbors who raises hay along with beef cattle. In exchange for selling some of the beef to his CSA subscribers, Leigh gets whatever hay hasn't been sold at the end of the season--typically 50 to 75 bails of it. The garlic field is covered over with a layer of hay about six inches thick, enough to block any sunlight that might reach the soil. "If the weed seeds don't get light, they can't grow," says Leigh. The garlic, however, has no problem pushing its way through the hay after it sprouts. By spring the unmistakable garlic leaves--slender and pointy--are already several inches long. Leigh won't need to water the garlic much at all. "Even that drought we had a couple of years ago when I was worried about the garlic, it did okay." Nor will he be adding any additional fertilizer. Garlic likes lots of organic matter. But you don't want to feed it too much or you'll get too much foliage and not enough bulb. When the scapes come up, sometime in June, they'll be cut and sent to subscribers as a treat in they're CSA boxes. Cutting the scapes also redirects the plants' energy toward making bigger bulgs. They'll be harvested when about two-thirds of the leaves have turned brown, usually around the end of June.